Brainerd Lakes Area: Several locations (below) that are close to lodging in Brainerd/Baxter include. Our service can also help you find lodging accommodations if staying in Brainerd/Baxter. Northland Arboretum- Central Minnesota's only Important Bird Area! Fritz-loven Park- a great spot to visit during spring/fall migrations! French Rapids Recreation Area- Bird along the Mississippi River for waterfowl and warblers! 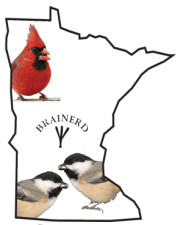 Aitkin County- One of the best counties for birding in the state! Some of the birds that can be found include Great-gray Owl, Sharp-tailed Grouse, Boreal Chickadee, Connecticut Warbler and many more depending on season. Sax-Zim Bog- The most famous bog in the state and home to the Sax-Zim Birding Festival! A very special and unique place to see many boreal species. to help save you 10% when using promo code #33! See more birds with your new gear with MN Bird Guide.